1. Heat oven to 375F. Combine flour, sugar, salt, baking powder, dill, and cheddar in a large mixing bowl. Slowly stir in beer and mix just until combined. Batter will be thick. Spread in a greased 8-inch loaf pan, brush with egg glaze if desired, and bake until golden brown and a toothpick stuck in the center comes out clean, about 45 minutes. 2. Cool in the pan on a rack for 10 minutes. Remove from pan and cool 10 more minutes. Serve warm or at room temperature. Wow, what a mouth watering bread, the color of cheddar in the crust is just amazing !!! This bread sounds delicious. I do love dill and cheddar. I’ve used box mixes for “beer bread” before (from Trader Joe’s), but used hard cider instead (because that’s what I drink, so why bother buying beer). I found that it gave the bread a little more sweetness, but still had the nice chewy consistency. You might give that a try if you don’t like the beer taste in the bread. Thanks for the recipe! Looking forward to trying! I saw this from a link on AT Kitchn and really want to try it. I bet it was denser/sandy because all of the fat comes from the cheddar, which can be “lean” at times. When I try it, I may replace some of the cheddar with a little olive oil or sour cream. It looks gorgeous! Sorry to hear that it didn’t turn out as you’d hoped but I’m happy to hear your friend enjoyed it. We’ve been making beer bread in our family for years. The fact that it takes one hour from start to baked is incredible! I like to use half white, half whole wheat flour. The whole wheat gives the loaf a much more rustic texture, not to mention a tad healthier. Thanks for the tip! I may try half whole-wheat next time, Anna. I had run out when I made this loaf, unfortunately. 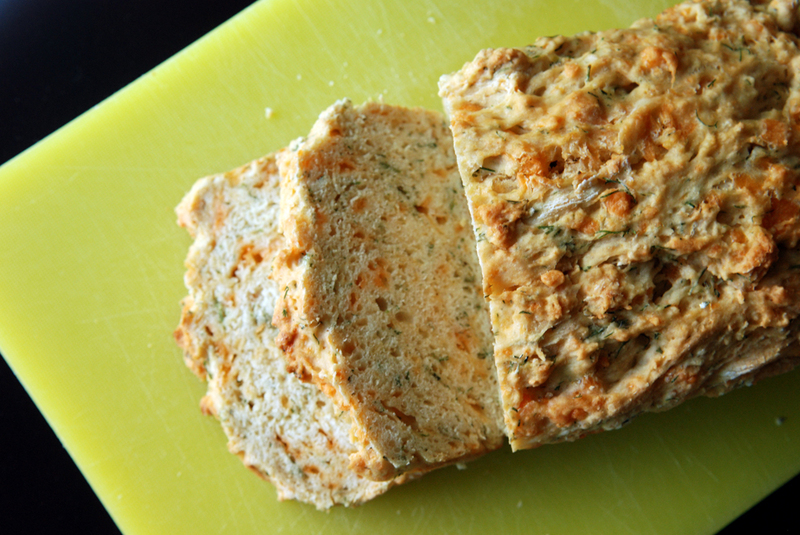 So many great flavours in this bread! Is there anything else I could substitute for the beer? I’m wanting to make this today, but we aren’t big beer drinkers so I don’t have any. I just finished baking this and eating a piece after it cooled down. It is amazing and I used an apricot beer made here in Alberta. For any other Calgary/Edmonton readers, you may know it (Alley Kat Apricat). 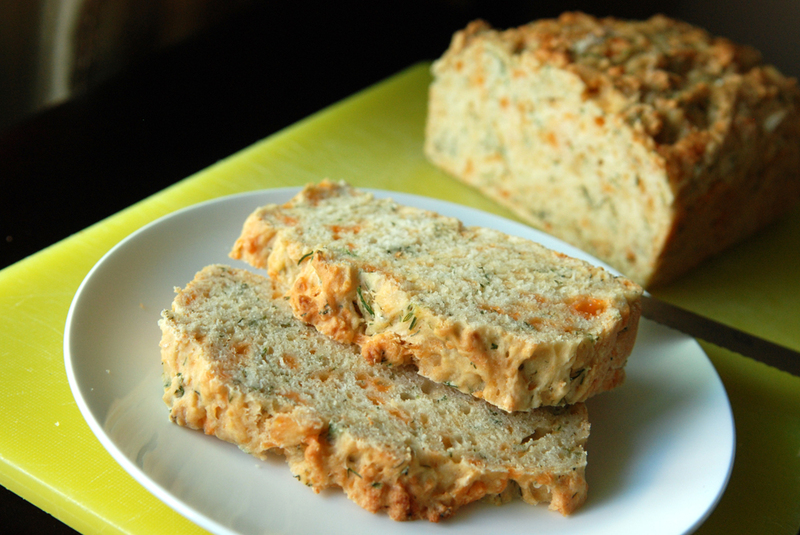 It went really nice with the cheddar and dill and doesn’t give an overly tangy beer taste. I’d love to give it a try with a non-alcoholic cider as well (and most likely will). I can imagine baking this all year around but agree this would be amazing in the fall/winter with a soup! Funny Paul, I used to make a VERY similar beer bread with Alley Kat Coffee beer, but used nuts and raisins + ww flour= best morning start… but they discontinued it?!? I think Aprikat sounds grand, as would their new mead. I made this a few days ago with a Guinness that had a nitrogen canister in it so it was super-charged when it went in the batter. From the picture you put up, I think I can tell that mine rose a little higher, and we didn’t find the texture too dense (for a quickbread), so maybe that would help you too.